West Virginia will be introducing a smartphone app designed to make voting in federal elections easier for residents serving their country overseas. Though just announced a few days ago, election integrity and computer security experts are already expressing concerns, mainly because of the issues still going on with Russia’s interference in the 2016 election. A recent federal indictment detailed Russia’s attempts to hack voting software during the last presidential election, and intelligence agencies in the United States are warning of something similar in the upcoming midterm elections. However, West Virginia Secretary of State Mac Warner and the Boston company Voatz -- which developed the app -- are confident in its security. To register, users must take a photo of their government-issued ID and a video of their face and upload them both to the app. Voatz’s facial recognition software will ensure that the both the picture on the ID and the selfie-style video are of the same person. After getting approved, users can then cast their ballot in the Voatz app. Ballots will be completely anonymous and recorded on blockchain -- a public ledger often associated with cryptocurrency that can be used to record any kind of data. Voatz will be strictly limited to West Virginians serving overseas. “There is nobody out there that deserves the right to vote any more than the guys that are out there, and the women that are out there, putting their lives on the line for us,” Warner said. Voatz was tested in two countries during this year’s primary elections. After four audits of the app’s tools, including its cloud and blockchain software, no issues were detected. However, according to Michael L. Queen, Warner’s deputy chief of staff, it will be up to each county individually if they want to utilize the app this November. Warner emphasized that traditional paper ballots will still be made available to all troops overseas. However, this new trend towards mobile voting is not universally well-received. 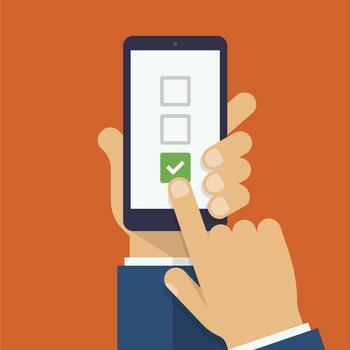 A political science professor at MIT, Charles Stewart III, doesn’t believe mobile voting is ready for “prime time,” but deemed West Virginia “the bold ones” for testing the technology. “There is something to be said sometimes for small scale pilots where we can learn the trade-offs,” Stewart said. Warner remains vigilant in his security efforts for mobile voting, as he lobbied the Department of Homeland Security to share any information that might help states clear up any election meddling. Warner has also recruited the state National Guard to help with any kind of election interference.